In the 87 days that Dennis McGillicuddy and colleagues spent in the Sargasso Sea in the summer of 2005, they were tossed around or chased by four hurricanes and two tropical storms: Franklin, Harvey, Irene, Maria, Nate, and Ophelia. Not one of those massive storms was as powerful as the one swirling in the water beneath them. From June to September, McGillicuddy and a team of more than 20 scientists from Woods Hole Oceanographic Institution and five other marine science labs tracked an eddy named A4. It was the oceanic equivalent of a hurricane—a huge mass of water spinning like a whirlpool, moving through the ocean for months, stretching across more than 62 miles (100 kilometers), stirring up a vortex of water and material from the depths to the surface. “Eddies are the internal weather of the sea,” says McGillicuddy, an associate scientist in the WHOI Applied Ocean Physics and Engineering Department. But unlike destructive hurricanes, eddies can be productive. As certain types of eddies stir the ocean, they draw nutrients up from the deep, fertilizing the waters to create blooms of microscopic marine plants in the open ocean, where little life was once thought to exist. The Sargasso Sea—south and east of the Gulf Stream—forms the geographic center of the North Atlantic Ocean. It is warmer, saltier, bluer, and clearer than most other parts of the North Atlantic, except for the floating mats of sargassum seaweed that gave the sea its name. For centuries, prevailing wisdom was that such open ocean waters were mostly desert-like, unproductive regions. A lecture on the Sargasso Sea in the early 1990s sparked McGillicuddy’s curiosity. 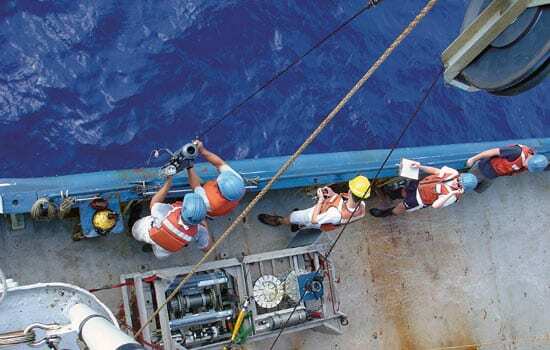 In the talk, Bill Jenkins, a senior scientist in the WHOI Marine Chemistry and Geochemistry Department, pointed out that scientists were finding more oxygen being produced and consumed in the open ocean than anyone expected. The suspects were phytoplankton, microscopic marine plants that produce oxygen in photosynthesis, and zooplankton (microscopic animals) and bacteria, which use oxygen as they consume plants and organic detritus that sink to the seafloor. Scientists found 10 times more microscopic life in the Sargasso Sea than anyone could explain, given the dearth of nitrate, phosphate, trace metals, and other nutrients that plants need to grow in sunlit surface waters. Researchers slowly developed the hypothesis that vortices of cold or warm water—eddies—might somehow act as a biological pump. “I had proposed a problem, and Dennis suggested a solution,” Jenkins said. “He had the clever idea that eddies were perturbing the layers of the water column, mixing different waters, and bringing nutrients up from below.” The upwelling of nutrients into the euphotic zone (the top 330 feet or 100 meters of the ocean, where light penetrates) would stimulate prodigious blooms of phytoplankton, which attract zooplankton and other animals up the food chain. The Eddies Dynamics, Mixing, Export, and Species composition (EDDIES) project was born. “Dennis has wanted to do this experiment since he was a graduate student,” said Dave Siegel, a longtime collaborator with McGillicuddy and an oceanographer from the University of California, Santa Barbara (UCSB). 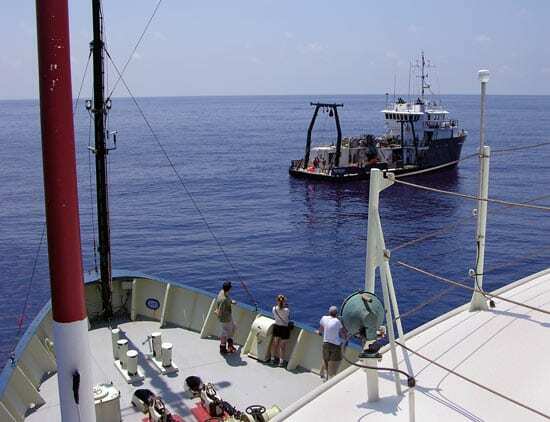 McGillicuddy mustered chemists, biologists, and physical oceanographers from WHOI, UCSB, Rutgers University, Bermuda Biological Station for Research (BBSR), Virginia Institute of Marine Sciences, Dalhousie University, and the University of Miami. 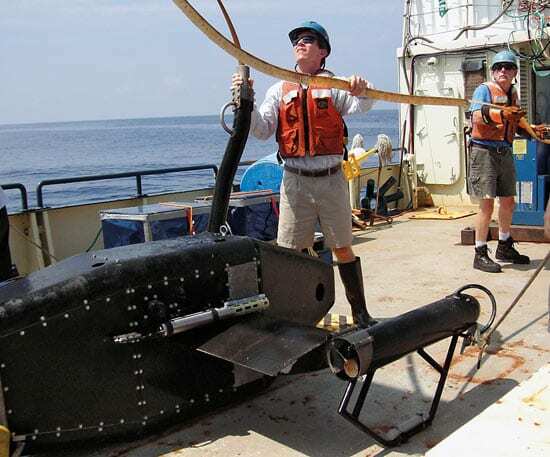 Together, they secured $3.5 million from the National Science Foundation, as well as five months of ship time over two years on the WHOI-operated research vessel Oceanus and the BBSR-operated Weatherbird II. The goal: to make detailed chemical, biological, and oceanographic measurements of a specific eddy by getting right into the middle of it. Eddies are distinct parcels of water that move and jostle within the ocean, much like warm and cold air masses or high- and low-pressure systems in the atmosphere. Eddies are formed by differences in ocean temperature and salinity that give water different densities. Like oil and water, water masses of different densities tend to keep separate, rather than mix. The largest eddies can contain up to 1,200 cubic miles (5,000 cubic kilometers) of water and can last for months to a year. Earth’s rotation—the Coriolis force—gives eddies their spin. To hunt for their target, McGillicuddy and colleagues used data from satellites, whose measurements of sea surface heights show telltale signs of eddies. Warm-water eddies form bumps in the ocean; cold-water eddies form depressions. The team examined several eddies and settled on anticyclone No. 4, or A4, a “mode water” eddy (see “The Hunt for 18° Water”) that stretched some 93 miles (150 kilometers) in diameter at the surface. The EDDIES program took a truly integrated approach, combining many tools—satellites, ships, moorings, drifters, robotic vehicles, computer models—and many types of scientists. 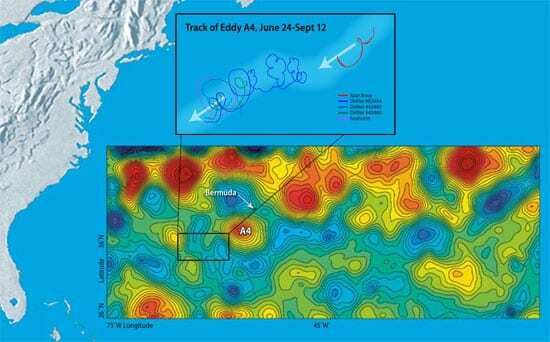 From June 20 to Sept. 14, 2005, the researchers zigzagged across the eddy as it drifted southwest about 3.7 miles (6 kilometers) per day. The team on Oceanus buzzed around collecting water and nutrient samples, measuring current speeds and directions, and towing WHOI biologist Cabell Davis’ Video Plankton Recorder through the turbulent swirl. Bill Jenkins and his lab mates measured natural chemical markers such as tritium, an indicator of the amount of plant-fueling nitrate being raised from the depths. WHOI Senior Scientist Jim Ledwell, an expert on using tracers in the ocean, injected sulfur hexafluoride, a harmless chemical, into the middle of the eddy and tracked how it spread up, down, and across the sea. At the same time, a research team on Weatherbird II made targeted measurements in the core of the eddy, measuring plant and animal productivity, the movement of particles, and thorium, a radioisotope that marks how much organic material is sinking from surface waters. Siegel used a radiometer to measure whether the eddy was disturbing the light penetrating the blue water. “Ocean scientists are moving toward a more holistic view of their research problems,” said Siegel. “Ocean science grows by filling in the cracks between disciplines. If you put a smart and diverse group of people together in a boat, a lot of good things can happen. People start to think outside of their own little research worlds, and together we can tell scientific stories that we couldn’t put together individually. Fueled by nutrients from the deep, diatoms bloomed to concentrations 10,000 to 100,000 times the norm—among the highest ever observed in the Sargasso Sea. 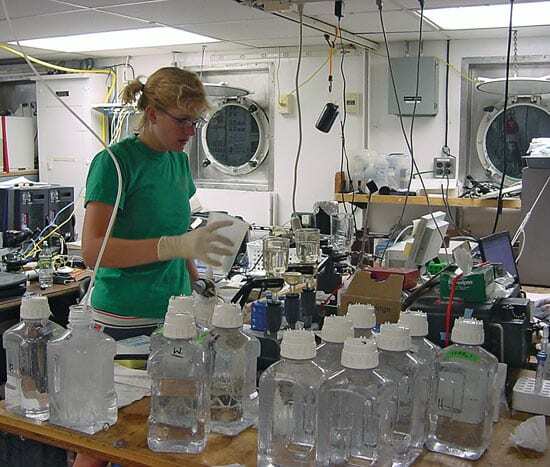 At the same time, the team was surprised to find historically low concentrations of oxygen in the depths, a sign of zooplankton and bacterial population explosions. It also meant that an awful lot of heat-trapping carbon dioxide may have been drawn out of the atmosphere and ocean surface, transformed by phytoplankton, and sunk to the bottom of the ocean. Six months after the last EDDIES researcher stepped off Oceanus, the scientists are still assessing and analyzing the wealth of data they collected on A4. 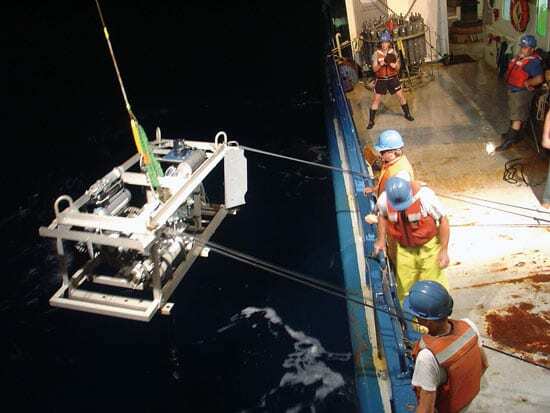 The team met in February 2006 at the international Ocean Sciences Meeting in Hawaii to share observations and collectively make sense of what they saw. Ultimately, the goal is to develop high-resolution computer models—McGillicuddy’s specialty—that can simulate and predict the full range of eddy dynamics. The EDDIES project is a critical step toward comprehending these great ocean storms, whose sheer size and scale are daunting. During the expedition, tropical storm Harvey made a direct hit in early August, cutting a path right across eddy A4. The eddy hardly felt Harvey; the monstrous atmospheric storm never came come close to breaking up the potent, voluminous swirl of water in the ocean. 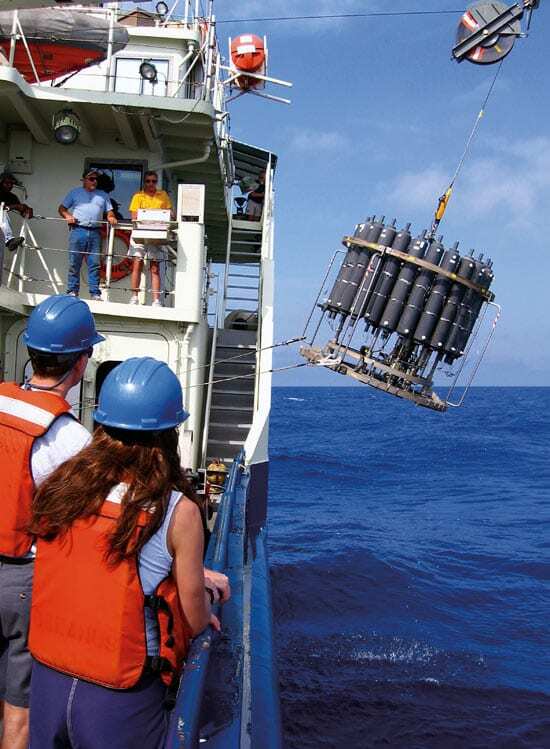 The EDDIES project received funding from the Chemical Oceanography, Biological Oceanography, and Physical Oceanography branches of the National Science Foundation.